Ever wanted to find a guide that would help you design all outdoor activities, including biking, hiking, running and travelling? 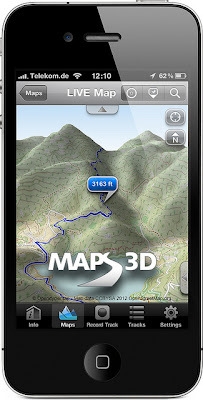 You no longer need to search, as there is a perfect app for planning, recording and sharing your rides or routes with your friends – meet Maps 3D - GPS Tracks for Bike, Hike, Ski & Outdoor by movingworld! Available in the Apple App Store for just £1.99, Maps 3D helps to get oriented outside of the road system by utilizing a precise elevation model as well as maps from OpenStreetMaps and OpenCyclemaps. The app also enables you to download any desired map section into your iPhone and use it when offline - since an internet connection may not always be available. With the advanced ability to point out lakes, rivers, mountains and hills, roads, paths and other landmarks Maps 3D guarantees you choose right direction and plan a precise route, so you never get lost even in unfamiliar terrain. The primary functions of Maps 3D include loading maps in advance over Wi-Fi or 3G with no further Internet connection needed thereafter; recording routes by GPS for coordination and exact elevations; evaluating routes including all information on the trip with elevation and speed profiles and using bike computer so all key tachograph data becomes available at a glance. Maps 3D features English and German languages and is compatible with iPhone, iPod touch and iPad running iOS 3.1.3 or later. Check the video guide provided below (unfortunately this is only available in German yet) and do not hesitate to have your say.